Well that's a bit of a mouthful isn't it! 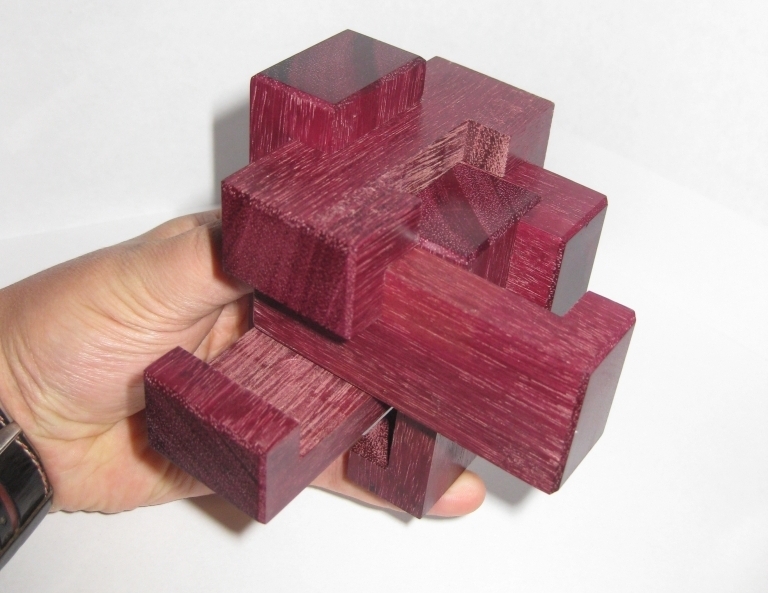 2 Halves is a burr puzzle designed by Gregory Benedetti, with my copy being made by the very talented Maurice Vigouroux. 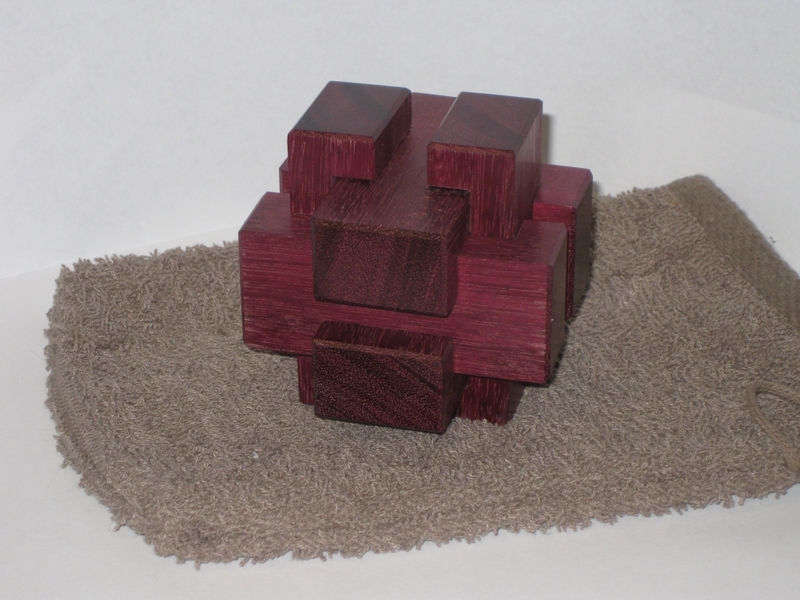 Back in November 2013, this came up for sale on Puzzle Paradise with a couple of options for woods used. 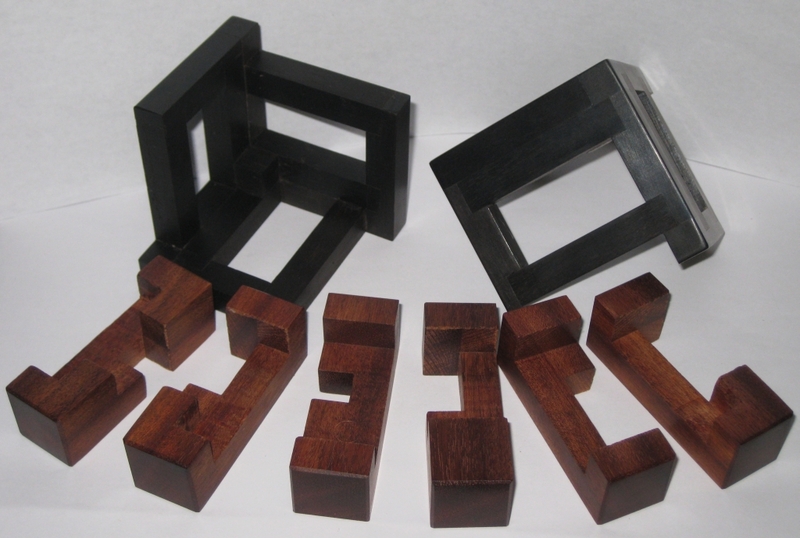 Seeing the Ebony cage and Bloodwood pieces, I didn't hesitate, and bought it there and then. I certainly wasn't disappointed. Despite not being particularly good with Burr puzzles, this doesn't look like a burr, and the jet black Ebony surrounding the deep red of the Bloodwood makes it look imposing. That's probably a good thing, as this is not a simple puzzle. It's not a small puzzle either. Each cubie is 7/16", making it 3" x 3" x 3" overall, meaning that Maurice was working with 1" thick stock to make the burr pieces. It's a great size and manipulating the pieces inside the frame is easy given the size of the pieces. It's heavy too. 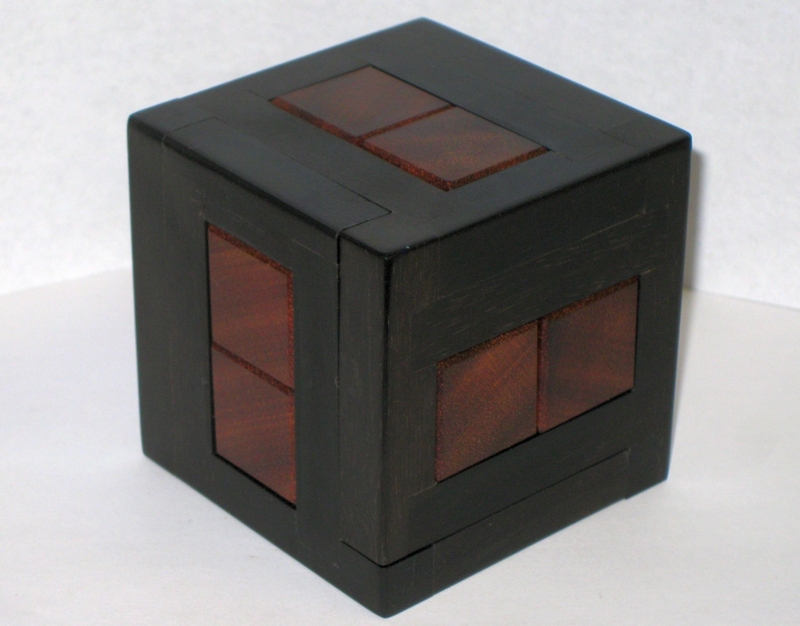 Ebony is a very dense heavy wood, so this puzzle has a really solid heft to it. 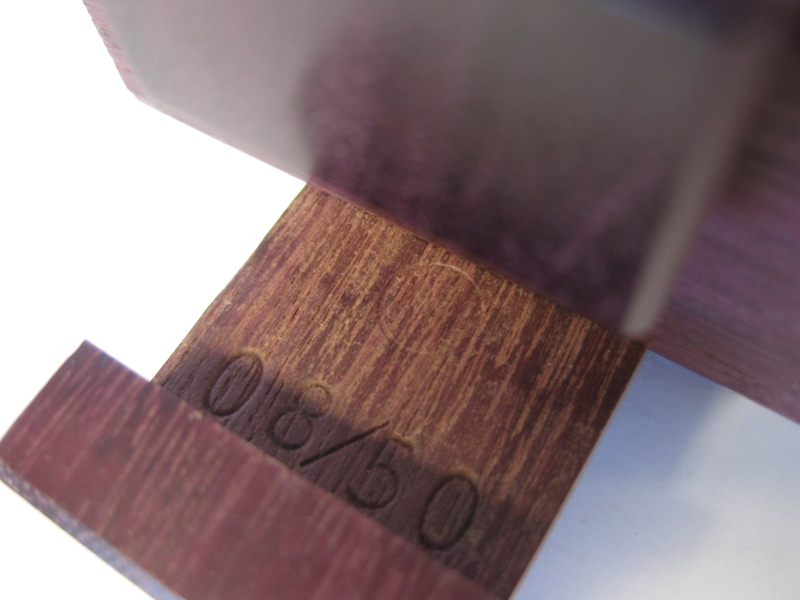 The fit and finish are excellent with the Ebony being polished to a reflective shine. The pieces all slide past each other perfectly, and the tolerances are spot on. The first night I spent around 40 minutes playing around with the puzzle and managed to create some space in the cage to move the burr pieces around a little, but I hit a dead-end and couldn't see a way to progress further. There seemed to be a huge amount of space in the puzzle, but the cage was still firmly held in place, and the was no way I was sliding any of the burr pieces out of the cage. This carried on for a few days where I'd spend 20 minutes or so each night trying to make progress and really getting nowhere. As often happens, things got busy, and the puzzle was left on a shelf for a while with pieces sticking out of the sides, looking a little like a hedgehog. Recently I had a little free time, and picked this up again, since it was sitting looking at me and I felt bad that I'd not finished it. After about an hour, I finally managed to shuffle the burr pieces into the right locations to be able to remove one half of the cage! Progress. It was quite the achievement to have made it this far, and spurred on by my success, I carried on to remove the rest of the pieces. I thought I was past the difficult part and the remainder was going to be easy. After all, I now had a lot of space, and removing the remaining pieces should be easy! Isn't it great when you're totally wrong. The puzzle is a level 17.14.9.5.3 puzzle. So removing the first half of the cage, I'd only finished the first 17 steps. I had another 14 to remove the first burr piece, and then another 9 to remove the second. This is one tough puzzle. I spent another 15 minutes figuring out how to move the pieces around and take that first burr piece out of the remaining cage half, but I finally got there. Let's just say I didn't do it in just 14 moves! As far as value for money goes, this has been a great puzzle. I've had a lot of puzzling time out of it, and I have to admit that I really enjoyed it. This is a little worrying for me, as I've never really found much fun in playing with Burr's. Maybe I've found something else that I do enjoy after all. The 2 Halves is certainly a different style of Burr, with the cage interacting with the burr pieces in such a way that it really adds an extra challenge. 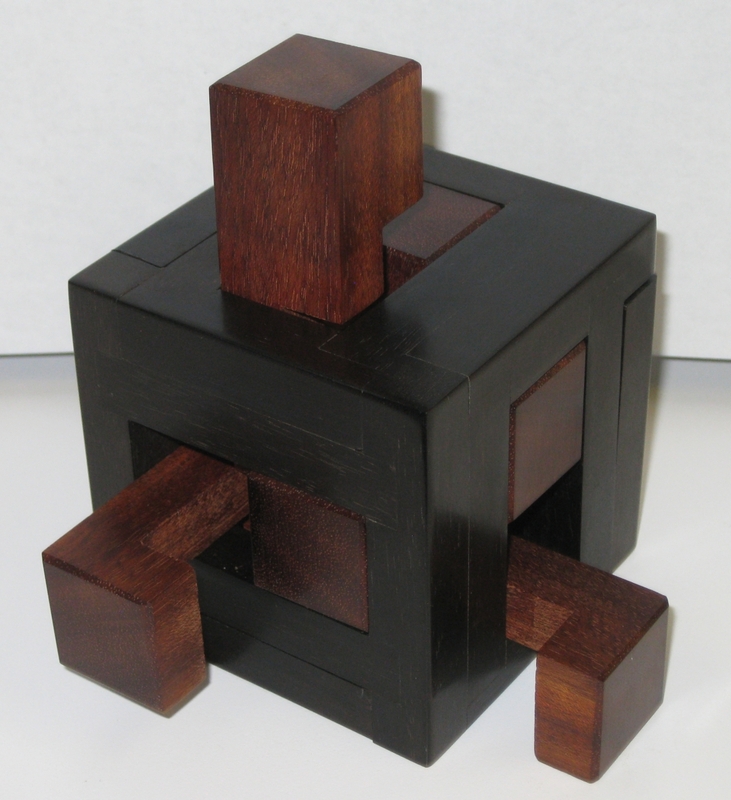 The cage itself blocks your view of the voids in the burr, making it much more difficult to see how to progress, and it also adds some structure, keeping the pieces in the right locations without needing an extra hand to prevent them from falling or rotating into a position which makes it difficult to move the next piece. Now, I freely admit that I'm not good enough with burr's to be able to re-assemble this one on my own. It was enough of a challenge to just take it apart. Not to mention that I didn't pay any attention to how the pieces came out, or the order, so I didn't even have a reference to how to put them back. There's only one possible assembly out of 1,844 possible orientations of the pieces in the final shape, so it could take a very long time to put this back together with trial and error. I know when I'm beaten, and turned to the trusty Burr Tools to help. 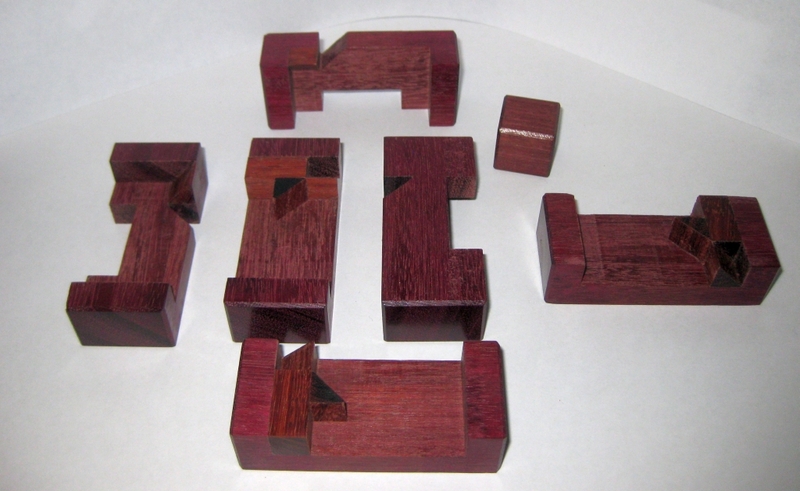 Even there it took me three attempts to get the pieces entered correctly for Burr Tools to be able to solve the puzzle. I have no idea how Gregory designed this, but I have to take my hat off to him. It's a great design, and I can't recommend it enough, even if you're like me, and are not a fan of Burr's normally.